Kelsie Low the Photographer: Previously the idea of a ‘Styled Shoot’ was totally not my cup of tea because my style of photography is very relaxed, natural, fun and non-posed and all of the styled shoots I had seen consisted of a beautiful setting, but then with an actual model dressed as either a bride or a groom, which didn’t feel very realistic to me. 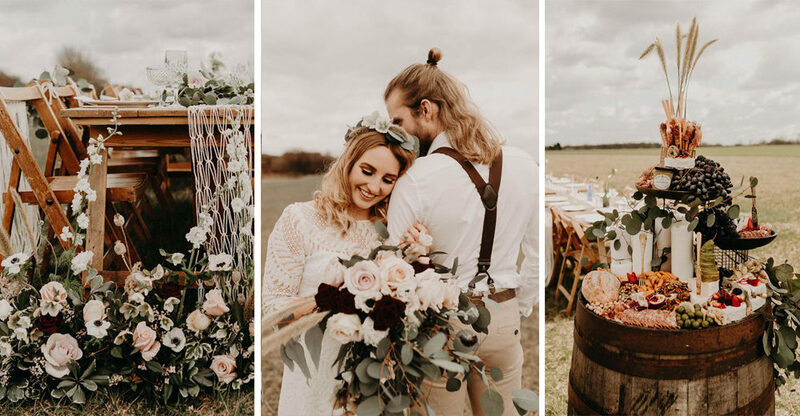 Of course if you’re looking for a more editorial vibe then great, but for me I knew if I was to plan a styled shoot then I would want a real couple so that my audience and future brides could really connect with them. For me it’s so important to capture the true connection between people and this is what I strive to do in all of the photographs I take. I didn’t like the idea of this being faked by two people pretending to be in love and so I set out on a search for an authentic couple with a lovely boho style. Thanks to the power Instagram, I stumbled across the perfect pair, aptly named ‘Two Bohemians’, Tyler and Luke. After a few conversations we were set and on the day they just couldn’t have been more perfect. So in love and full of genuine emotions we were able to capture some beautiful images together that really reflected their personalities and showed off the details provided by each supplier. The Barns at Lodge Farm: is a stunning new exclusive use wedding and events venue nestled in the Essex countryside just outside London. The venue is a full working farm, and consists of a variety of spaces for you to make your own – from the cosy, timber-framed Granary, to the epic industrial Grain Store amidst the rolling hills of arable farmland, The Barns are a truly unique blank canvas for you to create your own perfect, bespoke wedding day. Hair So Boho: When it came to the hair, I was going for an extremely natural, effortless look – which actually had quite a bit off effort to it still! I used 2 different curling techniques mixed together to achieve the unstructured waves and natural looking volume to Tyler’s blonde locks. In terms of the styling, this was kept minimal to tie in with the theme and to compliment the beautiful flower crown which had been made especially by the incredibly talented Becks at Velvet Rose. I used several of my favourite products to give the hair the hold that it needed, without looking like it had been caked in products, along with a little teasing at the root to prevent the hair looking flat and lifeless. To finish, I added a light misting of silkening spray to give the hair a gorgeous shine when the sun hit it and I replaced the use of hairspray with Sea Salt spray for that casual look. Beauty By Zoe: For makeup we decided to go for a bohemian look, fresh but still noticeable! Super flawless skin, but still focussing on the eyes to really make Tyler’s features pop. Almost as if it were an ‘undone’ kind of soft glam! Wonderland Invites: For the stationery, Jenna provided a bespoke suite which comprised invitation, information card and RSVP paired with Moss Green envelopes and foliage printed silk. The palette was kept neutral, with creamy florals and Sage Greens to evoke a real natural feel. She also provided menus, place cards, table numbers and table plan cards which were backed onto Perspex board with beautiful gold washi tape. Velvet Rose Flower Studio: Velvet Rose specialise in thoughtful and romantic floral story-telling for the lovers and the rule-breakers. Inspired by travel and interior design along with a love of 70s bohemia you can expect to find beautiful texture and show-stopping blooms arranged in a wild and flowing designs. We used a mixture of dried and fresh ingredients to create a real boho feel through the flowers. Dried grasses were also used to add texture and flow to the arrangements. Beautiful dark scabious and anemones created contrast with the dusky pink and champagne roses. We kept the arrangements wild and loose with an oversized, wild bouquet and meadow style runners which complimented the overall style of the shoot perfectly. Anthology Vintage Hire: Anthology provide gorgeous reclaimed wood trestle tables, vintage chairs, furniture and props to hire for your wedding or event. For this styled shoot we provided our vintage green armchairs and sofa which are perfect for relaxed seating. Our Persian rugs make a great ceremony aisle or dance floor and are also a great accessory to our seating areas. Our rustic reclaimed wood trestle tables and vintage folding chairs make the perfect furniture for your wedding breakfast and reception. Our brass vases and candlesticks compliment them perfectly for your table decor. Rock The Day Styling: We created an outside reception area with our handmade Macrame runners and chair backs and together with the vintage china and gorgeous florals it looked superb! We also made macrame hanging hoops for the barn interior as we thought it would work lovely within the setting. Our dream catcher backdrop was a lovely addition too! Vintage Flair China: The vintage crockery, cutlery and glasses are from Vintage Flair, a tableware hire company specialising in luxury vintage pieces. The plates were all fine bone china with gold gilt detail – a mix of floral designs and patterns adds a luxurious feel to a mis-matched setting. The beautiful vintage champagne saucers and wine glasses gives luxury to a rustic setting and the overall contrast between luxury vintage pieces and the wooden rustic tables creates the perfect tablescape for a boho wedding. Grape & Fig are the UK’s first and finest provider of luxe grazing tables and exquisite platters, bringing the Australasian phenomenon over to us Brits! For this shoot we provided a gorgeous grazing barrel full to the brim with cheeses, cured meats, breads, dips, nuts etc and of course a plethora of grapes and figs. The styling was finished with candles and luxe gold serve-wear. The post Boho on the Farm appeared first on ROCK MY WEDDING | UK WEDDING BLOG & DIRECTORY.